A new, stronger levee and flood wall protects the Lower 9th Ward from the Industrial Canal. This was the section that failed after Hurricane Katrina, letting a barge float through and flooding the working-class neighborhood and washing away home. Rick Luettich is a world-renowned hurricane storm-surge modeler who sits on the board of the New Orleans flood-protection authority. He said the city’s new $14.5-billion levee system designed to repel a 100-year storm is bigger and stronger than the one that collapsed with deadly consequences during Hurricane Katrina. But he’s also a parent and put the protection in personal, practical terms. This story was produced in conjunction with The Weather Channel. More Hurricane Katrina anniversary coverage can be found here. “If my daughter was buying a house in New Orleans with a 30-year mortgage, I’d have to tell her there’s a 25-percent chance water will come over the top of that system before she pays off the mortgage. “Now, the consequences probably won’t be catastrophic like they were during Katrina. But that 1-in-4 chance is there,” he said. Of all the questions being asked about New Orleans’ progress 10 years after the disaster that killed nearly 1,500 residents and clouded its future, the most persistent has been this: Is it safer now? Interviews with engineers and storm experts resulted in answers filled with caveats and concerns such as Luettich’s. The best summation: It’s safer for houses, but not necessarily for the people who live in them. That’s because the new system is the city’s best engineered and built ever, but it was designed to a lower level of protection than the one that failed. It’s also less than what Congress ordered in 1965. It was built to provide property insurance, not save lives. And experts insist it’s insufficient for an important city sitting on a sinking delta in hurricane alley during the age of climate-induced sea level rise and mega storms. The need for more protection from more intense storms varies across the city. It would be a great improvement on the various levees pieced together over the decades by separate authorities in adjoining parishes. That description was based on a model called the Standard Project Hurricane, which the corps used to determine the height of the walls and levees around New Orleans. The corps said such a storm would be so severe it was likely to occur only once every 200 years along the Louisiana coast. When the Saffir-Simpson Scale of rating hurricanes came into use in the 1970s, the corps rated the Standard Project Hurricane a Category 3. Later revisions to the model would raise it to a Category 4, reports said. But as Hurricane Katrina barreled toward the city 40 years later, it faced only a partially completed Category 3 system. A project the corps expected to build in just 13 years at a cost of $85 million now had a price tag of just under $1 billion – and a new completion date of 2017. Yet as early as 2002 hurricane researchers at Louisiana State University had already predicted the system had been designed too low for a storm of Katrina’s size. That system, criticized as “a system in name only” by the corps itself, suffered about 50 breaches during Katrina. Although the corps would consider Katrina a low Category 5 storm, its own investigations showed most of the breaches were not the result of the storm’s fury, but of errors in engineering and construction. In the aftermath, city and state officials initially demanded a Category 5 system, which a corps report said would call for 30-foot high levees – more than 10 feet higher than many spots in the old system. The estimated cost just for the east bank of the metro area was almost $11 billion. 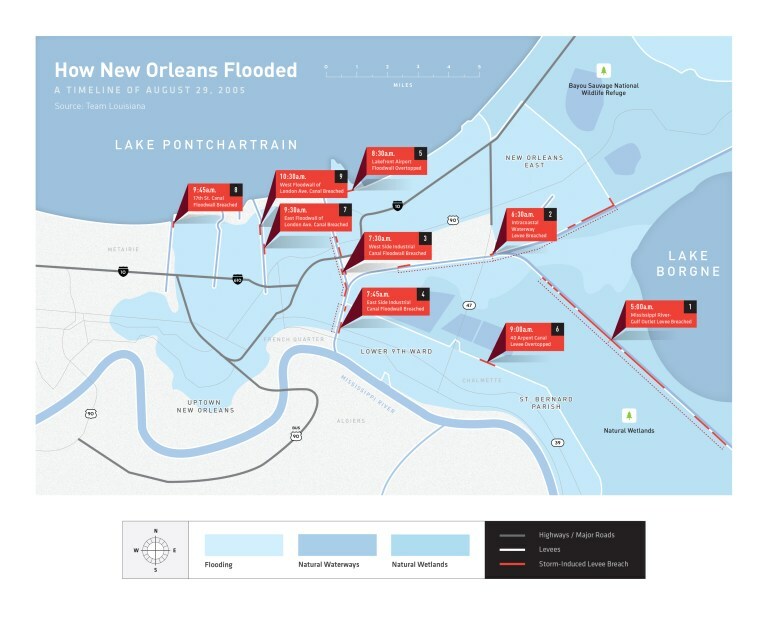 The sequence of levee breaches that flooded the city in 2005. But those same officials quickly backed away from that gold standard and settled for something far more necessary for the immediate recovery of a crippled city: A system that would pass muster with the federal flood-insurance program. Getting such a system underway would allow rebuilding to start. They reasoned that they could bargain later with the federal government to get better protection. They never had a chance. The Bush Administration’s budget concerns and the Republicans’ takeover of the U.S. House and then the Senate meant little more attention or money would be given to a system deemed adequate. A system that qualified for national flood insurance would be lower, less expensive – and much quicker to build than a Category 5 system, engineers said. So when the Bush administration said it would only commit to Category 3 protection immediately and study Category 5, the city relented. Yet within months after the storm, even that standard had been lowered. At the time, a Category 3 storm was considered one that returns every 200 to 300 years. But since FEMA would certify the city for flood insurance with only a 100-year system, that’s what Congress ordered and appropriated. It was a landmark shift in the nation’s commitment to protecting New Orleans. Suddenly all mention disappeared of the Standard Project Hurricane and “the most severe meteorological event likely to occur” – the standards for protection that had been part of every revision to the original authorization for 40 years. The immediate impact, engineers said, was reducing the design of levees and floodwalls about 2 to 4 feet on average across the system. “It’s as if your poorly built, three-story house collapsed, so the contractor said, ‘Ok, I’ll replace it with a well-made, two-story house,’ ” Davis said. Johnny Holzenthal of the Orleans Levee District check for cracks and other anomalies in the Orleans Avenue Canal levee earleir this month. But the switch to the flood-insurance standard had another, equally troubling effect, engineers said: A system designed to reduce property losses does not have to be as robust as one designed to protect lives. “In effect, it’s not really a standard that’s been set for safety reasons. It’s a standard that’s been set for obtaining affordable flood insurance only,” said Bob Turner, an engineer who is the regional director of the Southeast Louisiana Flood Protection Authority-East. New Orleanians should understand they live inside a system that promises only to help pay for property damage, not protect their lives, said Bob Jacobson, an engineer who reviewed the system for the flood protection authority. “It’s like any other insurance policy,” he said. “Your fire policy doesn’t say it will protect your life during a fire. If your house catches on fire, you have to leave, and when you come back you’ll have enough money to rebuild. But even the critics say the new, lower-level system makes the city safer because it is better built and sturdier than the old one, thanks to changes in design and closer oversight by local authorities. They are confident the new levees and floodwalls will not collapse, or breach, like the old ones even in major storms. And breaching, not being overtopped by a storm surge, is the real danger. For example, post-Katrina studies indicated that if the levees in St. Bernard Parish had only been overtopped, flooding in that area might only have been have been shin deep instead of reaching rooftops. The corps also added new features that make the city safer from such a Katrina-style inundation. The outfall drainage canals that were open to storm surge into Lake Pontchartrain have now been closed off, as has the Mississippi River–Gulf Outlet shipping channel. 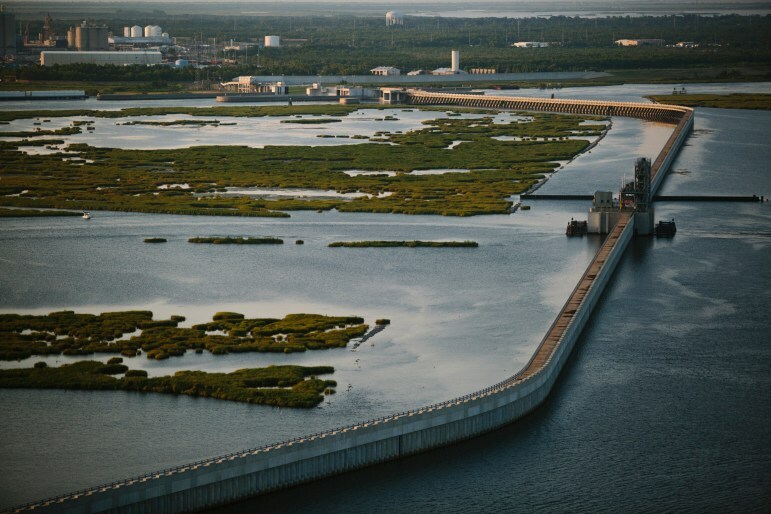 And the corps built a massive, $1.1 billion storm surge barrier across the western end of Lake Borgne. 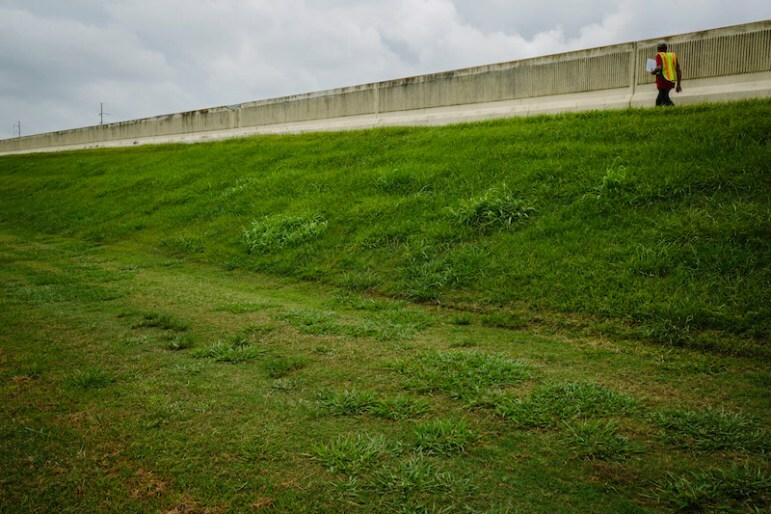 They also say once the grass on the city-side of the levees is reinforced with a synthetic mesh base – a process called armoring – the levees should not collapse even when the surge from a 500-year storm pours over their crests. Because of that the corps claims the armoring will give the system “500-year resiliency,” but Luettich warns that still isn’t enough. “A 100-year system with resilience added does not provide the same level of confidence as a system built to a 500-year standard,” he said. Part of the region\’s new levee system features this barrier, which is designed to block incoming surge from the Mississippi River — Gulf Outlet canal and the Gulf Intracoastal waterway. However, funding is not the only obstacle to better protection. 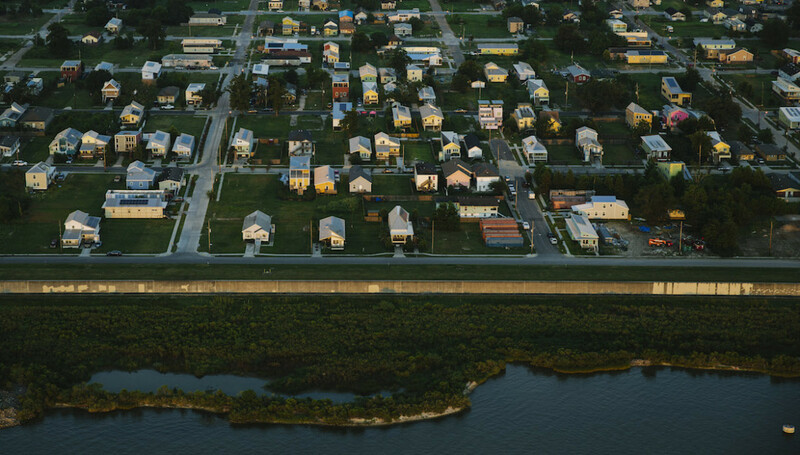 The region’s serious environmental issues pose challenges to levee design and safety. All of southeast Louisiana rests on deltas of the Mississippi River that are sinking due to flood-protection levees that blocked river sediments, as well as thousands of miles of canals dredged for oil and gas. The subsidence is so rapid the corps already had to raise some sections of the newly built levees more than a foot before they were turned over to the state. And the local authority knows it will face tens of millions of dollars in future levee lifts to maintain the heights needed to stay qualified for federal flood insurance. That sinking and erosion has also been removing the wetlands that once protected levees from punishment by the Gulf of Mexico’s waves. Some 2,000 square miles of coastal wetlands have been turned to open water since the 1930s, and more is being loss at the cumulative rate of a football field every hour. The National Oceanic and Atmospheric Administration reported that at those rates the remaining wetlands protecting the levees could be under water before the end of the century. Hurricane surge protection levees are built of soil because they have to repulse surge only for a few hours or days. If they are sitting in water 24/7, engineers say they will collapse. The state has a $50 billion, 50-year plan it hopes can reverse that trend in areas around New Orleans. The soft soils means building protection from stronger than 100-year storms may not mean higher levees but flanking the current system with wave protection. “Money aside, there’s a limit to how high you can build levees on those soils,” said Paul Kemp, a coastal geologist and member of the flood protection authority board. 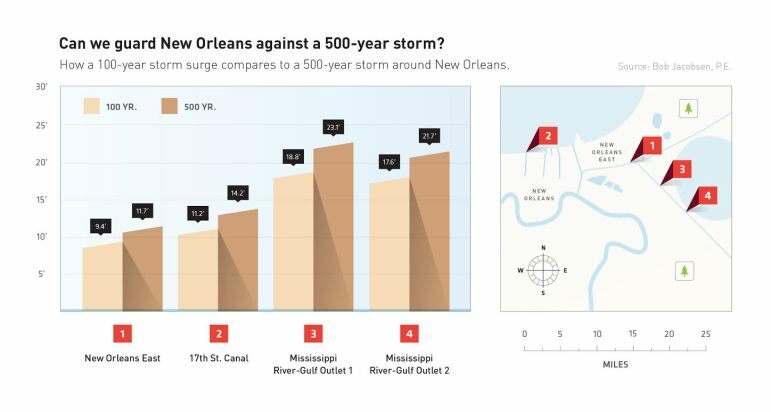 For New Orleans to feel safe, the engineers and storm experts said, the nation should have built a true 500-year system, with armoring to prevent breaches during even larger storms. But even that would not remove the only true way to protect lives when a storm approaches. “The truth is, what we have in place is a system built on the best guesstimates we can currently can make,” Jacobson said. “Protecting lives in a big storm now means getting people out of the way – so we can rebuild when we come back. Tulane’s Davis agreed and said only 100-year protection is a mistake. From 2013 to 2017, Bob Marshall covered environmental issues for The Lens, with a special focus on coastal restoration and wetlands. While at The Times-Picayune, his work chronicling the people, stories and issues of Louisiana’s wetlands was recognized with two Pulitzer Prizes and other awards. In 2012 Marshall was a member of the inaugural class inducted into the Loyola University School of Communications Den of Distinction.